Facebook profile page is by default in timeline format. Like it or hate it – Facebook is sticking to timeline format and moving ahead with features to make timeline format more appealing. Latest addition to spice up timeline format is introduction of timeline Apps. Now you can add apps specifically designed for timeline format and let other users know more about you, like are you a runner, foodie, traveler, music fan, movie buff ? 1. First step is finding app(s) that interests you. 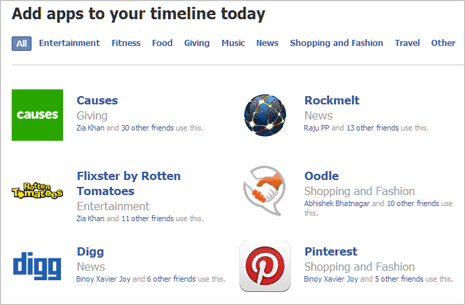 Fortunately, Facebook has dedicated directory of Apps for Timeline. You can browse different apps available across various categories like Entertainment, Fitness, Food, Giving, Music, News, Shopping, Fashion and Travel. 2. Once you select on App that you want to install on timeline format profile, click Install button located on Apps description page. Make sure you give permission to selected app to access your basic profile information for its functioning. 3. By default, apps will post the usage activity on your profile page which is visible to other friends. You can customize and configure to stop app activity posting for all or specific apps of your choice. Once you start using (multiple) timeline apps, preview your Facebook profile in timeline format – your apps usage activity will be listed at different places in timeline format profile. (In the same manner, it will be viewable by your friends). 4. You can easily remove any app activity listing from timeline profile. Just click Activity Log button at top right side of timeline profile page and then click to select ‘hide from timelime’ option next to item you want to hide from timelime profile.